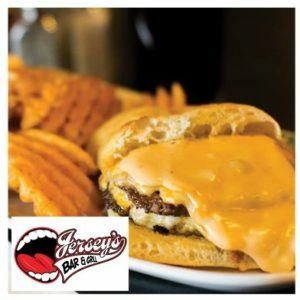 Food Fight Blog: Jersey's Bar and Grill - Neighbors Inc.
Our fourth stop on the 2019 Neighbors Food Fight tour was Jersey’s Bar and Grill on Concord Blvd. in Inver Grove Heights, another nifty neighborhood eating and drinking place in the northern Dakota County area. Their offer was “The Cheesiest Burger in Minnesota” and it lives up to its name. This burger comes with four different cheeses; American, Swiss, Pepper Jack and Cheddar Jack, and is covered in queso sauce. They are happy to oblige if you ask for the queso on the side. It is served in a rosemary flavored Tuscan flat bread, which is a pretty novel idea for a burger, and a wonderful choice on Jersey’s part. It was soft but neither mushy nor chewy, excellent texture, and the hint of rosemary made a delightful flavor addition to the delicious hamburger meat and the mixture of cheeses. My dining companion this day normally doesn’t like a lot of cheese with a burger, and he wasn’t paying attention to the description in the menu when he ordered. So he was a bit put off when his meal was put in front of him and he saw all the cheese. But then he began eating and within two bites was raving about the combination of flavors. Another convert to good cheeseburgers! So, four burgers down and one to go, and then I’m going to have to decide which burger gets my vote. It will be a difficult decision, and I haven’t even added the fifth option to the mix yet!